Daily Prompt: Prized Possession – Describe an item you were incredibly attached to as a child. What became of it? As a child I had a wonderful friend. He was small, only a couple of inches high, made of wood and covered with soft brown hair. He would sit on my bedside table and I would stroke him before I went to sleep. I called him, in my childlike way, “Cuddly Bear”. He was an aged bear. He was my Mum’s childhood friend too. In time his fur began to grow thin and then one day a small chunk of his head fell off. I was so mad at him. I renamed him “Rough Cuddly Bear” and wouldn’t talk to him for ages. Eventually of course I forgave him. After all, it wasn’t his fault he was falling to bits. I hope I look as good at his age. I guess if part of my head falls off it’ll be fairly fatal. Right now he’s in a wardrobe somewhere at my parents’ house, I think. I’m all grown up now and I don’t need furry little friends, and to prove it here’s a photo I just took of my bookcase. Draliman’s bookcase. I’m hard as nails, me. Oh. Er. Um. Who put those soft toys there? They’re not mine. Is that an Ally McBeal box set? Surely there’s been some mistake. Update 28/04/2013 – I found him! There is a picture of him here. Look at you doing a daily post prompt on the same day! I’m glad you still have some of your cuddly friends. I wish I did. 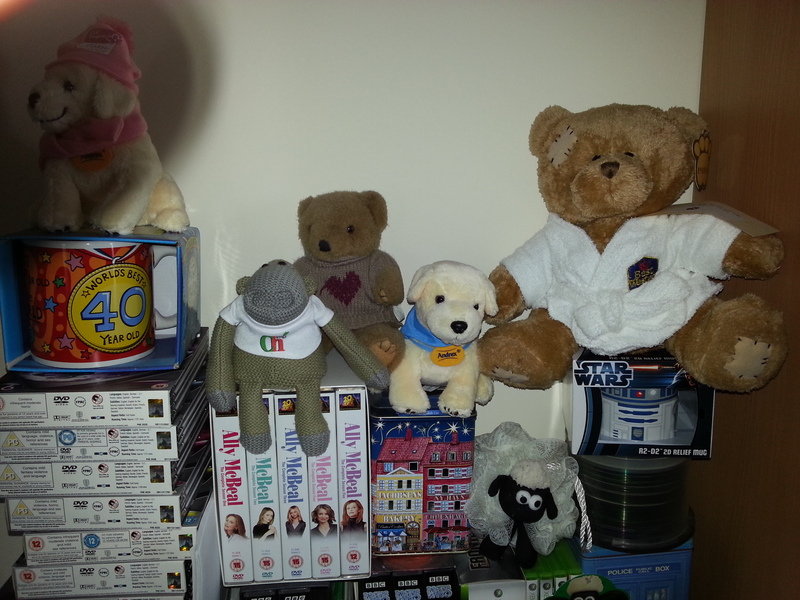 My Mum’s a bit of a hoarder so I still have my little fluffy chums though I must admit at this point, those ones on my bookcase are kinda, well, recent. Ahem. In my defence, the little puppies are charity puppies (collect “puppy points” from toilet roll packs and make a donation!). I love adults who have stuffed animals tucked away. It just proves they’re big softies and good people. Those stuffed animals look very much at home in that bookcase 🙂 Very nice. They do, don’t they! For some reason the flat feels more “homey” with them there. Now that he’s back in my mind I think I’ll try to track him down so he can join the rest of the gang on the bookcase!